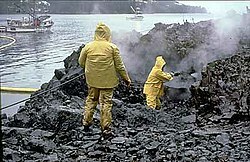 The Exxon Valdez oil spill was a shipping accident that happened off the coast of the United States on March 24, 1989. 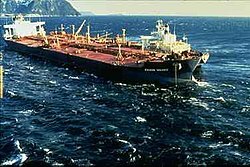 An oil tanker, the Exxon Valdez, hit a reef in Prince William Sound, Alaska. At the time of the disaster, the ship carried 53,094,510 U.S. gallons (44,210,430 imp gal/200,984,600 L) of crude oil. The accident caused a massive oil spill: 10.8 million U.S. gallons (9.0 million imp gal/41 million L) were spilled into the Prince William Sound. It was one of the worst man-made environmental disasters in the history of the United States. The ship had left the shipping lanes because of icebergs. The ship never returned to the shipping lane and hit Bligh Reef at around 12:04 AM. Later, people looked at the causes, and found that the people on board were badly trained and overworked. What made things worse was the fact that the government was not prepared to handle a disaster with such large consequences for the environment. This disaster badly damaged the ecosystems of the area. An estimated 21,300 fish died after being poisoned by the crude oil. The birds that ate the fish got sick. Some of the methods tried to clean up the oil were: burning, mechanical cleaning, and chemical dispersants. ↑ Lee, Douglas B. August 1989. Tragedy in Alaska waters. National Geographic 176, 2. pp. 260–263. This page was last changed on 17 April 2019, at 08:31.